There is so much that can be said about this game that it's difficult to know where to begin. When E. R. Jones introduced me to the game concepts, they were so exciting I had to bring it to the gaming world. Here are just a few things which make the game, in the words of RPGnet's Justin Bacon, "completely unlike anything I've seen before". One thing singled out by many reviewers is the use of scriff. This imagined substance gets into player characters, with the result that death is not the end, but merely the perhaps painful step to the next world and the next adventure. Diana Jones award winner and Sorcerer author Ron Edwards said it offered "some of the best answers" to the problems of character death in role playing games today, due to its unique use of death as a means of continuing the story. In my mind, the mechanic that holds it all together and makes it work is bias. It turns up again and again, in little ways: a modifier on your chance of success in skills, a limiter on what is possible in the current universe, a definition of what is known by the locals, a bonus to the chance to learn something new. Two numbers, one not greater than fifteen and the other usually not greater than ten, provide a simple and elegant method of sorting through hundreds of skills and ideas. Do spaceships and rayguns work in this world at all, or poorly, or well? What about fireball spells? Morphing to other forms? Telekinesis? The answers to these questions are quickly and easily determined in play thanks to bias. What I've always liked to say is that it preserves the integrity of the character and of the world. It lets the wizard remain a wizard even on a spaceship, without destroying the overall science fiction feeling of that world; and it lets the space marine fight effectively in the swords and sorcery setting without rolling over his opponents mercilessly. An often overlooked aspect of the game is the interfacing rules. 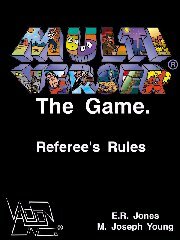 The system provides the referee with the ability to take player characters into other games--not merely into the worlds used by other games, but into the game systems themselves, connecting to the other game system such that the player will have the experience of being a character in that world, and the rules of that game system will hold sway wherever they would control a character created in that game. When we say that a Multiverser character can adventure in any book, any movie, any imagined world, and any other game, we mean exactly that. There is nothing this game cannot handle one way or another. A player character could become a D&D Magic-user, a World of Darkness hunter (or even a werewolf), a Champions superhero, playing in those games. Then when he dies, or verses out as we call it, he can take his new skills and equipment with him, converting it all back to Multiverser. It's an incredible game. You can order it from Valdron Inc for $49.95 (shipping paid in the U.S.), by mail or by credit card through CCNow (this link will add this product to a shopping cart) or PayPal (this link will connect you with PayPal to provide credit card payment information).